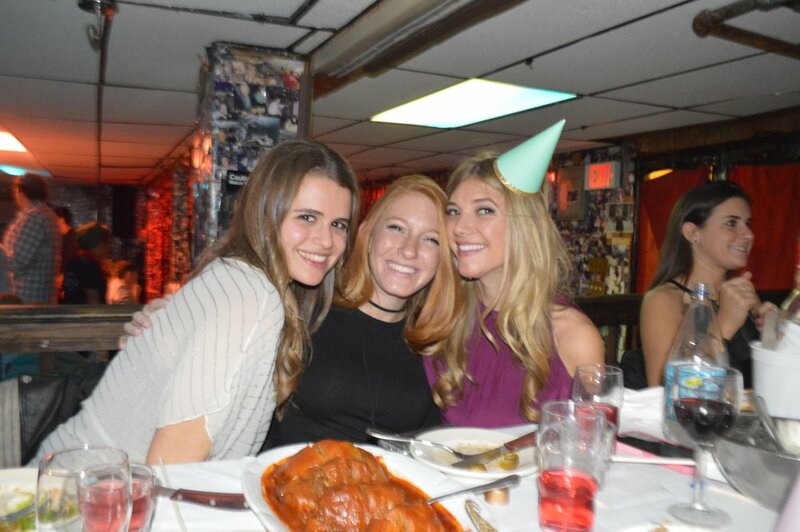 This post is all about my birthday night at Sammy's Romanian Steakhouse. I will start out by saying that if you haven’t yet been to Sammy’s its an absolute must go to! I haven’t laughed as hard as I did at Sammy’s since my college days. Sammy’s, located on the Lower East Side, has been in the business for over 40 years, and has definitely earned itself quite a reputation. I honestly (LOL) can’t believe this was my first time going. The vibe of the restaurant is dingy with fold up chairs and paper napkins, but don’t be fooled by the exterior because Sammy’s is probably one of the most, if not the most fun place to go for dinner in NYC! The restaurant serves thick and heavy old time Jewish cuisine, and the entertainer DJ Dani Luv plays a bunch of Jewish songs… It really brought me back to the Bat Mitzvah years; they even put you up on a chairs. But don’t get it wrong, you definitely do not have to be Jewish or know any Jewish songs to have a great time! Every single person in the restaurant was up on their feet dancing almost the entire night. I was completely overdressed… BUT what the heck it was my birthday, and I always love to dress up on my birthday! It wasn’t too difficult to decide what I wanted to wear on my birthday, as my favorite brand for dresses is unquestionably Ramy Brook! Although, I had never tried on this “cold shoulder” style Ramy Brook dress I knew it would fit because their clothes really run true to size throughout the entire collection. I wore the Lauren dress in the color Sangria because that color just seemed the most birthday festive to me. I paired the dress with my over-the-knee new Highland boots from Stuart Weitzman, and really felt ready to dance the night away. Side note: the boots looked completely ruined and blotchy when I took them off that night, so I took the Stuart Weitzman suede brush to them and in the morning they looked brand new again! Let me know who has been to Sammy’s?!? Would love to hear all the funny stories!